ACTAGIS Academy is the unique official authorised training centre in Switzerland delivering the knowledge and expertise for Governance, Security, Risk, Quality and Business Continuity. We deliver certifying training courses and exam preparation with very high success rates. We also elaborate custom training programs, tailored to your organization and discount options for grouped registrations. Our instructors are all certified professionals and experts, who bring with them over 25 years of field experience in the domain of IT Security, Governance, Risk, Quality and Business Continuity. We offer certification courses for international organizations such as ISACA, BCI, PECB and SABSA. The courses can be given either in your offices or in classrooms provided by ACTAGIS. 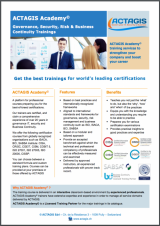 ACTAGIS, as the official and exclusive partner of the ISACA Swiss Chapter in the French part of Switzerland, proposes learning and preparation classes for all ISACA certifications (also worldwide for in-house trainings). ACTAGIS, as an official licensed training partner of the BCI for Europe and Asia Minor, proposes learning and preparation classes for BCI certifications and provides the exams sessions. ACTAGIS proposes worldwide, learning and preparation classes for CISSP with high experienced trainers. ACTAGIS, as the official partner of SABSA for Switzerland and France, proposes learning and preparation classes (in English and soon in French) for the SABSA certifications and provides the exams sessions. 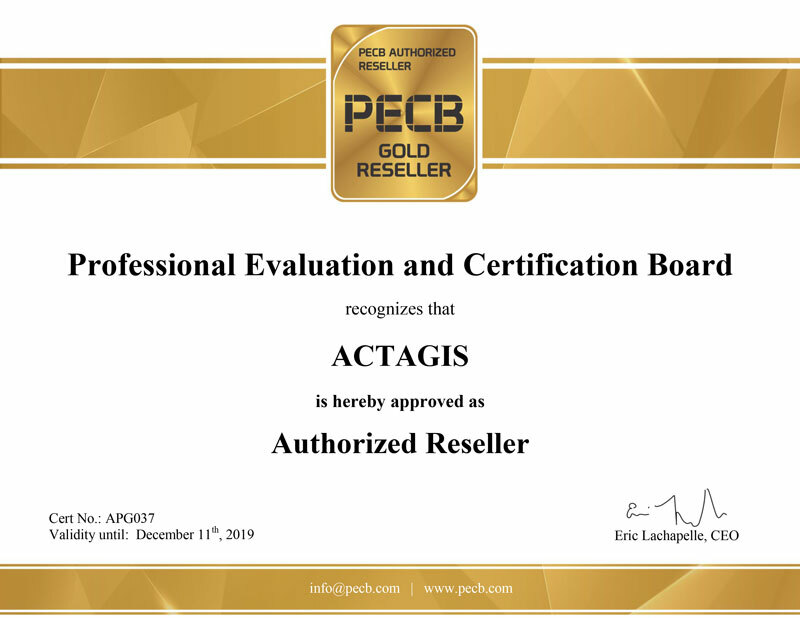 ACTAGIS, as an official PECB training partner proposes in Switzerland and Europe, learning and preparation classes for all PECB certifications.